Sending in that first paper opened the floodgates. One month after submitting the manuscript on the alpha and gamma helixes, on March 31, 1951, Pauling and Corey followed it with a full broadside, mailing PNAS no fewer than seven protein structure manuscripts in a single bundle. It was an audacious move. They offered more precise details about the alpha and gamma helixes, descriptions of the structures of synthetic polypeptides, pleated-sheet structures, and ideas about more complicated proteins like collagen and hemoglobin, hair and muscle, and feathers. It was a bravado display of Pauling's model-building methods. The papers offered maps, detailed down to the individual atoms, of structures most workers in the field believed would not be solved for decades. It would take months, perhaps years of review before the validity of the work could be confirmed. Max Perutz, one of Bragg's researchers, read all the Pauling-Corey papers in a single Saturday morning and set off immediately for his laboratory. If Pauling was correct and there were 3.7 angstroms in every turn of the alpha helix, then each individual amino acid should account for roughly 1.5 angstroms of a helix's length. That distance – the length accounted for by each amino acid – was very small, so small that it would take special experiments to show it on x-ray diffraction patterns. But it would be worth it to try, Perutz realized, because of all the many structures proposed for keratin, only Pauling's would create that particular spot. It would be a sort of fingerprint for the alpha helix. So Perutz got a strand of horsehair, set it up in an x-ray apparatus, loaded a piece of film curved in a way to catch the predicted reflections, and shot it. He developed the film and scanned it. There, just where he would expect it, was a fuzzy spot far on the margins of the film, an indication of a structural repeat every 1.5 angstroms. This was interesting, but it was not enough. So Perutz set up a porcupine quill and shot it. There was the spot. Then he found it in synthetic polypeptides. Then in hemoglobin. With growing excitement he went back into his files and found it on some old protein films shot years before, where the spot had been ignored. Perutz quickly wrote Pauling, "The fulfillment of this prediction and, finally, the discovery of this reflection in hemoglobin has been the most thrilling discovery of my life." He then published his results, concluding, "The spacing at which this reflection appears excludes all models except the 3.7 residue helix of Pauling, Corey and Branson, with which it is in complete accord." Faced with confirmation from his own workers, Bragg conceded at least a part of the race to Pauling, writing him graciously in June, "Your solution of the alpha-keratin chain carries conviction. It fits in so beautifully with many facts.... I do congratulate you most warmly on what I feel is a very real and vital advance toward the understanding of proteins." Bragg's words, however, were carefully chosen. He held off saying anything specific about any of Pauling's other structures. In fact the British researchers could find no evidence of the gamma helix anywhere, and were starting to think that perhaps it did not exist outside of the imaginations of Pauling and his coworkers. 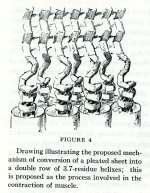 Neither were they convinced by many of Pauling's other proposed structures, with the possible exception of the pleated sheets and synthetic polypeptides. The alpha helix was certainly important, as Bragg had said. Pauling might have won the first leg of this race. But the alpha helix was not in itself a complete protein, at least outside of a few fibers, hair, and horn. In most cases it seemed to form a part of other proteins, a section perhaps. It did not explain the functioning of any of the important proteins. In the British view, the alpha helix was the no more than the first step in a very long journey. See Also: The structure of proteins: Two hydrogen-bonded helical configurations of the polypeptide chain. April - May 1951. See Also: "Atomic coordinates and structure factors for two helical configurations of polypeptide chains." April - May 1951. See Also: "The structure of synthetic polypeptides." April - May 1951. See Also: "The pleated sheet, a new layer configuration of polypeptide chains." April - May 1951. See Also: "The structure of feather rachis keratin." April - May 1951. See Also: "The structure of hair, muscle, and related proteins." April - May 1951. See Also: "The structure of fibrous proteins of the collagen-gelatin group." April - May 1951. Representation of the structure of alpha-keratin. April - May 1951. Representation of the contraction of muscle. April - May 1951.